I remember when I first came out as gay, I wanted to read other gay writers. I wanted to listen to gay music, and wear gay t-shirts, and stitch a gay patch to my high school backpack. Gay was the thing to be, as far as I was concerned, and “gay bling” was hot currency. Along with my proclivity for rainbows came the opinion that the lack of this dearth of gay pride was a clear indication that there was gay bigotry afoot. Certainly, if they weren’t shouting slogans at the front of the Chorus Line, they were holding up “God Hates Fags” signs with the other Christianists. This was a simple, reductive way of viewing the world, and one that provided me with a sense of both victimhood, and superiority. That’s a dangerous mix, right there. I was reminded of that experience a few weeks back when I was scrolling through the HuffPost Religion page, looking for something remotely Pagan. Compared to WitchVox, this place was a barren desert. Search “Pagan” on the site, and you come up with a few references to New Gingrich, some pieces on Stonehenge and Beltane, and a piece on how Easter eggs have pagan roots. I’m not hating on any of those posts, but there was a part of me that wanted something more. In my time on Patheos, I’ve witnessed some amazing writing, reporting, and community dialogue taking place on the Pagan Channel blogs. On my blog alone, started as it was to be a place for me to process my own work through ADF’s Dedicant Path, I’ve seen vibrant, respectful, meaningful dialogue taking place. We don’t post here so that our ideas win out; we post here to initiate or further along the conversation. We post here to be understood, or to ask questions, or to raise a point that seems missing from the conversation. By and large, this has been a respectful, insightful process. Recently HuffPost Religion put a call out to our community about books on Paganism that every Pagan and those interested in the varied strands of Paganism should read. 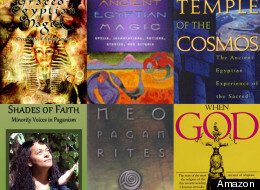 The result is this great list of 27 books that range from introductory to scholarly in nature and cover the entire gamut of Pagan religions — Witchcraft, Wicca, Shamanism, Asatru, Druidism, Egyptian and Hellenic. These books grapple with issues of sexuality, tell personal stories of faith, and provide information on the various Pagan religious rites. HuffPost Religion hopes that this list will be equally valuable for those who identify as Pagans, as well as those who are interested in Paganism, both academically and as a spiritual pursuit. Many of you contributed to this list on Facebook, under the organization of David Dashifen Kees. I’m grateful for your contributions, and the time and effort David put into this task. The list, I’m sure you’ll agree, is far from conclusive. The idea that 27 books would ever cover the “entire gamut” of “Pagan religions” is likely inspiring more than one spark across the Interwebs, but come on — it’s a start, no? For many looking at this list of books, the idea that there was anything to Paganism outside of Wicca (the Buffy kind) will be somewhat of a shocker. The inclusion of more representations of Paganism on HuffPost is a step in the right direction, I think. The gay teenager in me, the one who scrolls through sites in search of Pagan Pride, is calmed for the moment. But if that teenager is ever going to grow into maturity, it may be time to become a little more proactive in the conversation, myself. If one notices that there is something missing in the world, that might just mean that they are the person to create it. Do you feel like it might be possible for us to have the same quality of dialogue on HuffPost that we have on Bishop In The Grove? Do you think that this opening could provide Pagans and polytheists a chance to be better understood? I wonder what you think about this kind of representation of Paganism on mainstream sites. For various reasons related to their business model and (exploitive) treatment of writers, I generally try to avoid Huffington Post articles and will not comment on the site. It’s a very good article, Teo, and I am glad to see more pagan-friendly content on any web site. Nice article(s)! Thanks for the comment, Rory. I’m glad you enjoyed the articles. My experience with the HuffPost editors has been only good so far, and I’m grateful for the opportunity to provide a pagan perspective on a site that is usually dominated by the Major 3. Again, thanks for the comment and the support. Of course it is a step forward. And, of course, it represents both risks and opportunities. I think it can be difficult at times to write about issues that are contentious within the Pagan community, and translating that for non-Pagans while doing justice to the subject matter. There is also the question of writing about one’s own Paganism, and how this intersects (and often, doesn’t) with the Paganism that is the collective community. A thought-bubble about one’s latent (or not-so-latent) Christian leanings could have quite different and unintended implications when aired in a mainstream setting, for example. Those musings aside, I wish you all the very best with this opportunity. Indeed, I weigh the risks. Writing about one’s religious and spiritual experiences in any public forum can be tricky – even on a site like Patheos. As for communicating experiences to Pagans and non-Pagans, I’ve found that it helps to be as true to my own experiences as possible, and avoid presenting as a “representative” to the group. Perhaps it’s better at this point in our evolution, to simply allow our voices to be heard. Again, thank you for the comment, and the kind words. If anyone is going to explain us, present us, shine a spotlight on us, then I want it to BE us. I don’t want us to be processed through someone else’s filter. Can we be contentious, fractious, argumentative, and can we just plain old disagree with each other? Uh, yeah! I never saw a completely homogenized or pasteurized religion in my life. Ever since I came *out* in Pagan society, I have argued for and worked for a place at the larger table. Pull up a seat. We have arrived. Good luck. I generally avoid HuffPost’s religious articles because I find that they have a higher-than-average group of smugly superior atheists/anti-theists posting in their comments section. People who go out of their way to do nothing but troll the idea of spirituality and religion. I understand that it is no means indicative of the posting base, but it is an annoyance I try to avoid as best I can. I’m glad that your eloquence and insight will be used to represent us on a website that IS dominated by the Big Three. I look forward to seeing you, and other intelligent posters, take a stab at reflecting the myriad of pagan views on this site. I am a Muslim and I actually wrote them a few times plus left comments about giving voice to the pagan community at HuffPost. Oops, it posted by mistake before I was done. Anyway, Quran commands us to contemplate on Nature and says there are many signs in it. In many ways, it became another earth-centered path for me. What really rocks is the Sufi teaching on nature being the original Quran. I feel really good that maybe my suggestion helped bring some representation of the pagan community to HuffPost (though I think they have a lot farther to go with it). Paganism is fascinating and diverse and HuffPost will grow stronger by letting Pagans have their own section for sharing and exploring paganism. I’m really pleased to see this!! I learned a smidgen about Islam and environmental concerns when I was teaching a “Religion, Nature, and Society” class and would love to learn more. Anything you could point me towards would be much appreciated! Are you still with OBOD? Teo, I can’t think of any writer I’d rather have “representing” Paganism on a site like HuffPo. I suspect you’ll see a more contentious breed of commentators on HuffPo than you’ve seen here, but your writing reflects a lovely spirit that is just hard to be mean to. Congrats, Teo, on a great article and on getting it posted at HuffPo. Every time I come here to read a post (or, in this case, read the one at HuffPo) you inspire me to try and be a better and more consistent writer. Then I run Diablo 3. Regardless, hopefully you won’t be the only Pagan voice at HuffPo (outside the comments) for long. Whether it’s me or others, I think that we’ve gotten our foot in the door over the past few weeks and it would be a shame not to grab the opportunity while we have the chance! Now …. what was I going to do next. Oh yeah! Diablo 3, of course. The Huffington Post has made great strides to increase awareness and foster religious and cultural pluralism; it is also good to see that they are inclusive regarding Paganism, too! I think this article does a wonderful job about discussing many kinds of representations of Paganism on a mainstream sites. From particular stories and experiences there can be a great flowering of understanding. Each individual is, in essence, an individual representation of the Pagan Milieu. It is important, however, to note this need not become a universalized representation of any Pagan Path, but an individual ontology. And I found that many of the experiences you’ve had with your family also echoes and interlaces with my own. This is an article I find great resonance with in terms of spirituality and relating it family and friends. Luckily, my mom is very understanding, and that, to me, is what matters most. Still, at times, it can be a lonely place to be when there is no immediate community where ideas, fellowship, and good discussions can nurture that Path(s) each of us walk. What more, being in an environment that does not foster open discussion and understanding about minority Faiths & Traditions amongst communities the world over can seem all the more arduous in terms of relating with others, but connections abound, regardless when walking with Spirit and in Space/Time. As Walkers Between Worlds, we need not confuse loneliness with solitude. It is from self-understandings, the blood, sweat, and tears of personal meditations that many understandings begin and fruition in the vast wildness that is Paganism. A pluralistic understanding of Paganism from each and every voice can deepen our own experiences and learnings.